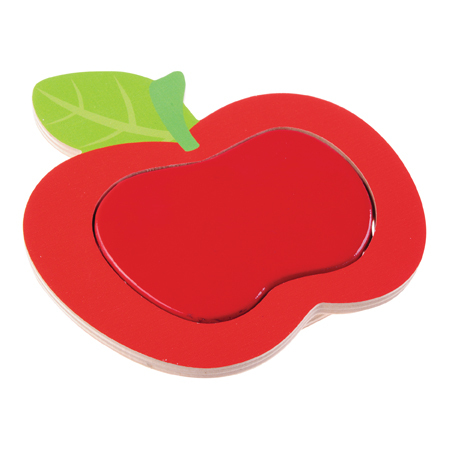 Pack contains: 4x Apple with smooth PVC coating. All packs of the individual sensory elements can be magnetically attached freely to the basic elements (only the birdfeeder in pack 2 needs to be fixed to a specific location – on the tree). The Countryside Sensory Collection allows you to create a colourful and fascinating play area that stimulates children’s creativity and imagination whilst allowing them to explore new shapes and textures. Basic elements – tree, meadow, grass container and 2 fences – are made from lacquered board and MDF. Other individual sensory elements purchased separately (flowers, animals etc.) are made of safe lacquered plywood and have different textured fabrics to enhance the sensory features.